We’re very excited to offer an amazing trip to one of the most dramatic and unique places to go kayaking in the whole world. 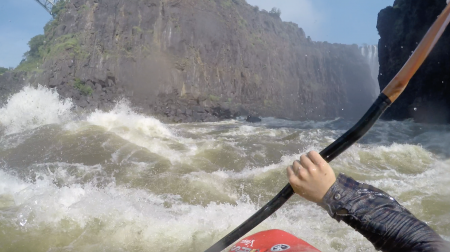 Warm water, spectacular scenery and driving through a national park every day just to get to the river are just some of the things that make this a trip of a lifetime – a must for every white water kayaker! Top quality, low ratio coaching and guiding with World Leading coaches including Lowri Davies, Sam Ward and Bartosz Czauderna. Coaching and trip specifics tailored to your personal needs. 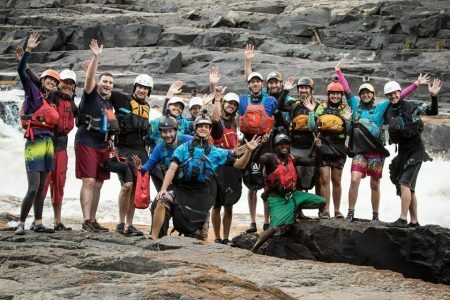 Sleep on pristine beaches under a blanket of stars on an incredible 4-day all inclusive raft-supported descent of Batoka Gorge. See Victoria Falls from above and below! Be one of the few people to experience showering in the base of the falls or even swimming in the pools below. See hippos and elephants while supping a G&T on an all-incluive sunset safari boat cruise on the Upper Zambezi. All shuttles, porters, park fees, logistics and assistance with pre-trip planning. Optional extras include a game safari in the legendary Chobe National Park, bungee jumps, zip lines, helicopter rides, micro lights and much more! 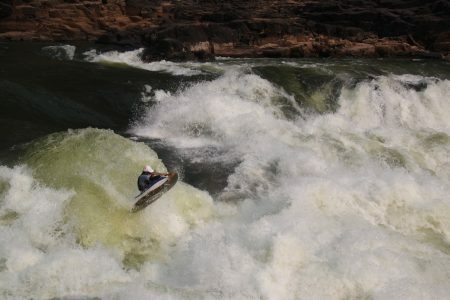 The Zambezi River is justifiably one of the most famous sections of white water in the world. The kayaking is located in the Batoka Gorge, directly below Victoria Falls – one of the seven natural wonders of the world. Most videos you’ve seen no doubt focused on the big and dramatic rapids, such “Commercial Suicide” or “Oblivion”. What you may not have realised is that there are loads of grade 3 and 4 rapids, and almost everything is potageable. 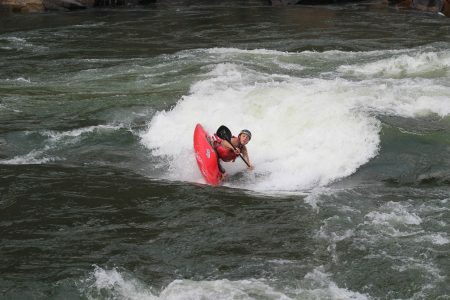 So, whether you are a confident grade 3+ paddler and it’s your first time out of the UK or you are looking to hone those big volume down-river and play techniques, the Zambezi has amazing white water for you to enjoy! 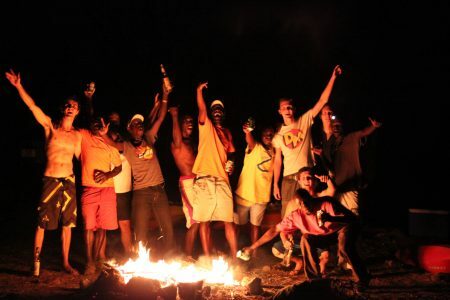 The two week trip is run by world class kayakers and coaches who’s passion for the sport, technical expertise and in depth knowledge of the Zambezi River will help you to get the most from your trip of a lifetime. We are working with the brilliant SafPar and staying at their beautiful Waterfront base on the river banks of the Upper Zambezi. This is not only a spectacular place to stay, with daily sunsets to make your heart melt, but means that our dedicated vehicle and driver will be there to take us directly to the river. Maximum fun, minimum faff. Our final few days of paddling are an opportunity for you to set the agenda. Re-run your favourite rapids, get freestyle coaching on the big waves or go back to run the rapid you weren’t ready for last time. Our low ratios allow us to tailor around the wants and needs of the group. During your trip, you will have a couple of “rest days”. You might not think you’ll need them, but trust us when we say you’ll appreciate them in order to make the most of your full 2 weeks! This is an opportunity to go on safari, bungee jump over rapid 2, take a helicopter or micro light ride or make use of your Kaza Visa to visit Zimbabwe… or just chill by the pool and watch the monkeys! Who is the trip suitable for? Intermediate / advanced paddlers. 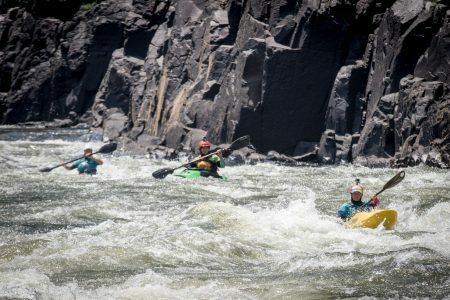 If you have a reasonable level of fitness, a solid whitewater roll and you are confident on grade 3+ there will be plenty of fun to be had on the Zambezi. A minimum group size of 6 is need to be reached for this trip to go ahead. – Advice prior to trip on the climate, equipment needed and general travel advice. – The cost of any extra activities e.g. safari, bungee jump, sky dive etc. Please contact your local doctor well in advance of the trip. They will fill you in on everything that you need to know. We very much hope that you will join us on this epic trip to one of the world’s 7 wonders!